Tiger Woods completed a massive career comeback by winning the Masters, and resumed the chase for Jack Nicklaus' record of 18 major victories. 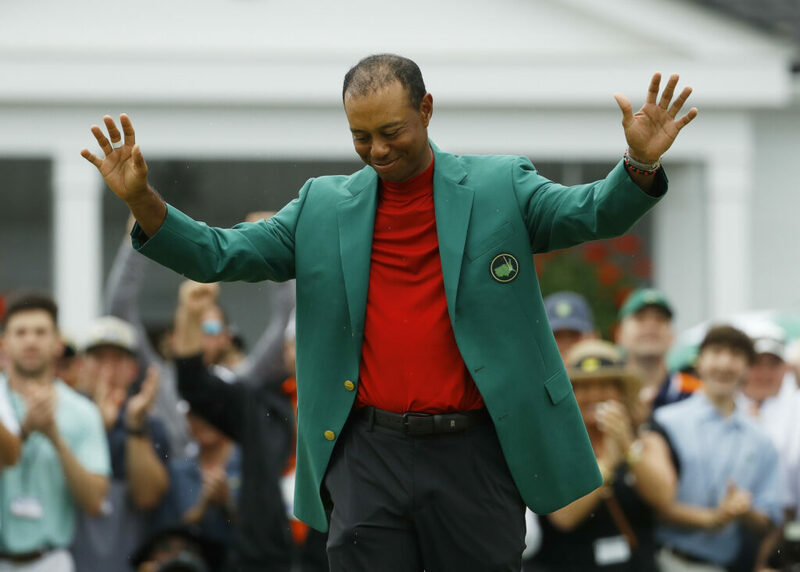 So much appeal of that red shirt beneath a green jacket involved looking back at all Woods had to overcome to reach that moment – a Masters champion again – that so many thought never would happen. The fourth surgery to rebuild his left knee. The private affairs that became public, shattering his image. The balky back that required four more surgeries, the last one out of desperation because he barely could walk, much less play golf. And a new generation of stars he inspired who were younger, stronger and capable. Whether the record is in play, Nicklaus can expect plenty of questions. For years he could rarely get through any conversation without someone asking him whether he thought Woods could top his mark. So imagine the effect of winning the Masters, especially the way this one played out. Six players had at least a share of the lead at one point on the back nine – four of them major champions – and there was a five-way tie for the lead when the final group was in the 15th fairway. It was anyone’s game until Francesco Molinari, who earlier hit an 8-iron in Rae’s Creek on the 12th hole for double bogey, knocked a wedge shot off a tree limb and into the water on the par-5 15th that led to double bogey. And then it’s the U.S. Open in June at Pebble Beach. If the Masters is the most memorable of his 15 majors, Pebble Beach remains his greatest performance. Woods won there in 2000 by a record 15 shots, even with a triple bogey in the third round. Ten years later he tied for fourth at the U.S. Open at Pebble, three shots behind. Woods was 24 when he won the U.S. Open at Pebble and 26 when we won at Bethpage Black. Now he’s 43. Getting to Nicklaus’ record of 18 major victories is only easier because Woods is one major closer, a conversation his caddie Joe LaCava said they have shared.